hand picked and full of flavour. Driscoll’s® Sweet Blackberries are prized for their wonderfully natural, sweet flavour. Grown throughout the UK by our selected growers each berry is handpicked at the peak of ripeness to ensure the best flavour is captured in every single berry. We are so passionate about our blackberries that only 1% of the initial seedlings make it to our farms! In contrast to the traditional hedge grown blackberries Driscoll’s® Sweet Blackberries are perfect for snacking on due to their full bodied sweeter flavour but also versatile enough to compliment both sweet and savoury dishes or to add a twist to canapes and drinks. As well as being great tasting Driscoll’s® Sweet Blackberries pack a nutritional punch, containing Vitamins C , E and K as well as fibre and protein2. The blackberry is a drupelet, or a cluster of fruits and the seed inside each drupelet contributes to the berry’s nutrient value. Studies show blackberries have one of the highest antioxidant contents per serving of any food tested. In a 2006 study published in The American Journal of Clinical Nutrition1, scientists indicated that blackberries’ antioxidant content of 5.75 millimoles per serving was far above that of other foods. This means that regular consumption of blackberries may have a positive impact on health, athletic performance and disease risk. Their dark colour ensures blackberries have one of the highest antioxidant levels of all fruits. Antioxidants are known for lowering the risk of a number of cancers – but to get maximum benefit blackberries should be eaten whole and as nature intended! How to look after and enjoy! Store your sweet blackberries in the fridge and just before eating rinse gently with cool water. Ideally let the berries reach room temperature to enjoy their full flavour. Our growers live and breathe berries – most are family farms that have been passed down the generations with the benefit of many years of experience in growing and harvesting the perfect berries. Located in the fertile Vale of Strathmore, Perthshire the traditional berry growing area in Scotland, Colbeggie farm is owned by Andy Barrie the third generation of his family to do so. The farm has the benefit of long summer daylight hours with a moderate temperature which enable the Sweet Blackberries to produce their natural sugars. The farm has specialised in growing berries for the last 25 years and maintains quality by organising pickers in small groups with a dedicated supervisor. Lutton Farm is a family run farm on the Cambridgeshire and Northamptonshire border. The family have been growing berries for over 50 years, with currently three generations of the Long family managing the business. The farm focuses on flavour and quality and have a solid reputation of consistently supplying top quality fruit. Lutton Farm were one of our first innovative growers producing Driscoll’s® Sweet Blackberries. Clock House Farm has several sites across Kent including a recently established glasshouse dedicated to Sweet Blackberry growing. As part of the community Clock House Farm regularly host local schools and youth groups enabling them to learn first hand how berries are grown. Father and son team, Robert and Oli Pascall use dedicated picking teams for harvesting sweet blackberries ensuring that the fruit is picked at its optimum flavour. Taste of London Festival, Regents Park 14 – 18 June. Come and see us at stand D5 to sample the true taste of summer! Adding blackberries to almost any salad couldn't be easier. It is a great way to add a healthy boost of fibre, antioxidants and flavour. In this blackberry salad recipe, ripe pear and an Asian-style dressing brings it all together. Arrange lettuce, blackberries, pear, cucumber, green onion and almonds evenly on four salad plates. Drizzle salad with dressing to taste. Rinse and pat dry ribs. Mix paprika, black pepper, sugar, chilli powder, salt, garlic powder and cayenne in small bowl until well blended. Rub spice mixture into each side of ribs. Place ribs on flat baking sheet, cover with plastic wrap and refrigerate 2 hours or overnight. Heat oil in a medium saucepan over medium-high heat and cook onions 4 minutes or until soft. Add garlic and cook 1 minute. Stir in chipotle paste and cook 1 minute, stirring constantly. Add blackberries, vinegar, sugar and salt, stir until blended. Bring to a boil, stirring frequently. Reduce heat to low and simmer 35 minutes or until reduced. Remove from heat. Pour into blender or food processor and puree until smooth. Strain mixture to remove seeds. Grill ribs over indirect heat for 20 to 25 minutes. Brush both sides of ribs with blackberry chipotle sauce. Turn ribs over and baste every 10 minutes. Repeat two to three times as the ribs cook through. When the meat pulls away from the bone, the ribs are done.Take ribs off the grill and allow to rest for 10 minutes. Sprinkle ribs with coriander and serve. Preheat oven 180°. Lightly grease bottom and side of two 6 x 2-inch round cake pans. Line bottom of each pan with round of parchment paper. Grease paper and dust pans with flour, tapping out excess. Set aside. Whisk together flour, baking powder and salt in a medium bowl. Combine milk, lemon zest and vanilla extract in a separate bowl. Beat butter and sugar in the bowl of an electric mixer on high speed about 3 minutes or until light and fluffy. Reduce speed to low and alternately add flour mixture and milk mixture in several additions, starting and ending with flour mixture just until combined. Set aside. In a clean mixing bowl, beat egg whites until stiff peaks form. Gently fold beaten egg whites into cake batter in 3 additions until evenly combined. Evenly divide batter between cake pans and bake 30 to 35 minutes or until golden and cake tester inserted into centre of cake comes out clean. Cool in pans on wire rack 10 minutes. Invert to cool completely. Beat butter and vanilla with an electric mixer on high speed until light and fluffy, about 3 minutes. Decrease speed to medium-low and add sugar, about tablespoon at a time, mixing thoroughly between additions. Add lemon curd and beat just until blended. Place one cake layer on a cake plate or stand. Spread about 1/2 frosting on cake layer leaving 1/2-inch border. Top with single layer blackberries. Spread thin layer of frosting on other cake layer and place frosting side down on top of blackberries and press down gently to secure. Frost top and sides of cake with thin coat of frosting and refrigerate 15 minutes to set. Frost cake with remaining frosting. Top cake with remaining blackberries. If not serving cake immediately, refrigerate until ready. Remove from refrigerator 15 to 30 minutes before serving. Thread blackberries, mango and prawns alternately on wooden skewers. Combine soy sauce, vinegar, sugar, oil, ginger and garlic to make a thin glaze. Brush onto prepared skewers, coating all sides. Grill skewers 3 minutes per side, carefully sliding spatula under berries when turning. Line a baking sheet with foil for easier clean-up. Mix meat, crumbs, soy sauce, ketchup, ginger and green onions until well combined. Press a thin layer of meat around each blackberry, sealing completely. Place on prepared baking sheet. Bake 10-12 minutes until meat is cooked, turning balls over half-way through for more even browning. To prepare sauce, combine blackberries, hoisin sauce and ketchup in a small saucepan. Cook over medium heat, pressing or mashing blackberries into sauce. Simmer until heated through and slightly thickened. Serve sauce and meatballs warm. Whisk oil, Dijon mustard, lemon juice, thyme leaves, salt and pepper in a bowl until blended. Refrigerate any leftovers. Mix blackberries, rice, turkey, celery, radishes and walnuts in medium bowl. Stir in just enough vinaigrette to moisten salad. Serve or refrigerate until serving. Cut blackberries in half crosswise and set aside. Beat eggs, water, salt and pepper together in a large bowl. Heat an 8-inch non-stick frying pan over medium-high heat. Add 1 teaspoon butter and coat bottom of pan. Pour ¼ egg mixture into pan. When egg starts to bubble, push towards centre with a spatula, and tilt pan to allow uncooked portion to run underneath. Continue around edges until eggs are set. Place one-fourth each cheese and blackberries on half the omelette. Drizzle with about 2 teaspoons honey if desired. A rub can be wet or dry and is different from a marinade because it's applied directly to the meat surface. This wet rub of blackberry purée, mustard, garlic and herbs also has a little vinegar which will helps tenderise the meat while roasting. Preheat oven to 200°. Purée blackberries in a blender or food processor until smooth. Press through a sieve to remove seeds. Discard solids. Combine blackberry purée, Dijon mustard, vinegar, 6 cloves garlic, rosemary, thyme, salt and pepper in a medium bowl. Set aside. Pierce meat using meat fork every 1 inch. Rub half the blackberry herb mixture over the lamb, coating the outside completely. Sprinkle remaining 24 peeled halved garlic cloves in a large roasting pan. Place lamb in roasting pan. Let stand 20 minutes. Roast 30 minutes. Reduce oven temperature to 180° and continue to roast 1 hour longer until meat thermometer reads 145°F for medium-rare. Remove lamb from pan and let rest for 10 to 15 minutes before carving. Pour off all but 1 tablespoon drippings from roasting pan. Add 250ml chicken stock to roasting pan and stir with a wooden spoon to loosen and dissolve any browned bits. Pour stock mixture into a blender or food processor and purée until smooth. Combine garlic broth mixture, remaining chicken stock, remaining blackberry purée and cornflour in a small saucepan. Bring to a boil over medium heat, stirring constantly; boil 1 minute. Stir in blackberries. Serve over sliced lamb. Grilled cheese is not just for lunch anymore. Enjoy this wonderful combination for a breakfast filled with juicy berry flavour and texture. Waffles are a fantastic bread choice for this hearty sandwich. Toast 4 of the waffles. Arrange 4 waffles on work surface. Spread 2 tablespoons mascarpone and 2 tablespoons apricot preserves on each. Arrange 1/2 cup blackberries on each in a single layer. Top each with 1 of remaining waffles and press down firmly. Cook prawns 8 to 10 minutes or until they are no longer glossy in appearance. Cook potatoes in boiling water until tender. Drain, cut in half and set aside. Peel oranges. Cut segments from membrane with a sharp knife, collecting enough juice to make 3 tablespoons and reserving segments separately. Whisk together orange juice, oil and vinegar. Season with salt and pepper. Combine prawns, remaining 2 tablespoons oil, fennel, shallot and lemon zest in a large bowl. Season with salt and pepper. Arrange prawns under the fennel mixture in a single layer. Grill over medium-high heat until prawns are charred. Just before removing from grill, drizzle each with 1 teaspoon vinaigrette. Toss lettuce lightly with some of the vinaigrette. Gently mix in blackberries, potatoes, orange segments and additional vinaigrette as needed. Divide salad onto four plates. Slide prawns and fennel over salads and serve. MIX blackberries, mint leaves, sugar, lemon juice, and lime juice in a tall glass. To make the blondies, in a medium bowl, stir melted butter and brown sugar until smooth. Add the egg, vanilla, salt and stir vigorously until smooth. Add the flour and half the almonds and stir until no streaks remain. Spread half the batter across the baking tin, top with the blackberry caramel, spreading it out as evenly as you can. Top with the rest of the batter and spread out over the caramel, using a toothpick to marble. Press in the remaining blackberries and scatter over the flaked almonds. Bake for 20 to 25 minutes until a toothpick inserted into the middle comes out relatively clean. Transfer quickly and efficiently onto a wire rack to cool, then cut into squares. By muddling the blackberries with rosemary this refeshing cocktail gets a full-bodied punch. Mixed with sour mix, tequila and topped off with fizzy sparkling wine, you'll definitely want to make a large batch of this blackberry cocktail recipe. Muddle the rosemary and berries well in a cocktail shaker. Add the sour mix, tequila and ice. Shake until well-chilled. Strain into a small Champagne or sparkling wine. Garnish with the remaining blackberry. This extraordinary bite-sized appetizer has three easy, make-ahead components that are assembled just before serving. The salty and sweet combination is delicious. If you want a special hors d'oeuvre for a brunch, try these tartlets. Combine the flour and salt in a food processor fitted with the metal chopping blade and pulse to combine. Add the butter and cream cheese and pulse about 10 times, until the mixture begins to clump together. Gather up the dough and shape into a thick disk. Wrap in plastic wrap and refrigerate until chilled and easy to handle, about 2 hours. Preheat oven to 400ºF. Position oven rack in the center of the oven. Butter two 12-cup miniature muffin pans. Divide the dough into 24 balls. One at a time, place a ball of dough in a muffin cup, and use your fingers to press it firmly and evenly up the sides to make a pastry shell. (A wooden tart tamper, available at kitchenware stores and online, can help the job go quickly.) Pierce the shells with a fork. Freeze for 5 minutes. Keep the oven at 400°F. Spoon warm onions into tart shells.Top each with 2 or 3 blackberry pieces, and stand the bacon between the berries. Sprinkle with the sage and serve. Indulgent is hardly the word for this wonderful dessert; but fresh blackberries work wonders with cutting its richness. Flavourful egg bread is soaked in a custard spiked with almond extract and orange zest. Delicious on its own, it's even better with a dollop of whipped cream or vanilla ice cream. Preheat the oven to 160F. Lightly butter six 10-ounce custard dishes or ramekins. Heat Single cream in a saucepan over medium heat until simmering. Whisk together eggs, sugar, vanilla, almond extract and orange zest in a large bowl. Gradually whisk in the warm cream. Add cubed bread and let stand, stirring occasionally, until some of the custard has been absorbed, about 10 minutes. Divide blackberries evenly among custard dishes, about 5 berries per dish. Spoon equal amounts bread mixture into the dishes. Sprinkle each with 1 tablespoon almounds. Bake until puddings are evenly puffed and a knife inserted in the center comes out clean, about 40 minutes. Let stand 10 mintues, top each with whipped cream, if using, and sprinkle with remaining sugar. Serve warm. Beat the crème fraiche, garlic and gorgonzola together to make the base. Spread it across the pizza dough. Toss the kale and red onion in a bowl with olive oil, salt and pepper. Add this to the top of the pizza base along with the blackberries, extra gorgonzola and walnuts, drizzle with olive oil and season with thyme. Bake for 10-15 mins, until the base is puffed and golden. Sift the flour into a bowl with the salt and sugar. Add in the eggs, beating until smooth, then mix in the melted butter. Gradually add the milk, whisking until you have no lumps, straining through a sieve if you’re not happy there are no lumps. Put the blackberries in the dish and gently pour over the batter. Bake for 30 minutes, until golden and just set but still wobbly. Leave to settle for 10-15 minutes then serve, warm. Heat a large, heavy-bottomed non-stick frying pan or cast iron skillet over a medium-to-high heat with 1 tbsp. of olive oil and knob of butter, garlic and thyme. Place the fish in the pan and cook, without moving it (you want it to create a self-sealing crust) for three or so minutes, baste with the melted butter. When it comes away from the pan naturally, flip it over and finish for a couple more minutes, continuing to baste it. Once just cooked through, divide the fish between plates with the remoulade. I like to season the fish with a little more of the vinegar (as you would lemon juice). Garnish with more fresh herbs. Sift the flour into a bowl, add the egg and egg yolk then gradually whisk in the milk until smooth. Whisk in 2 teaspoons oil and set aside for 10 minutes. Add the strawberries to a liquidiser or food processor and blend until smooth. Press through a sieve to remove the seeds, if liked then mix with the lime rind. Whisk the pancake batter once more then pour into a jug. Heat 1 tablespoon of oil in the base of an 18cm/7inch non-stick frying pan, pour out the excess oil and keep in a small bowl. Pour 2-3 tablespoons of the batter into the hot pan and tilt the pan so that the batter thinly covers the base. Cook for a minute or two until the underside is golden, loosen with a knife then flip over and cook the second side until golden. Slide the pancake out of the pan on to a plate and keep hot. Re-oil the pan as before and continue cooking pancakes until all the batter is used up. 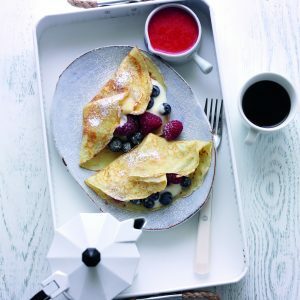 Spoon a little of the yogurt over each pancake, sprinkle with some of the berries then fold in half and arrange two pancakes on each serving plate. 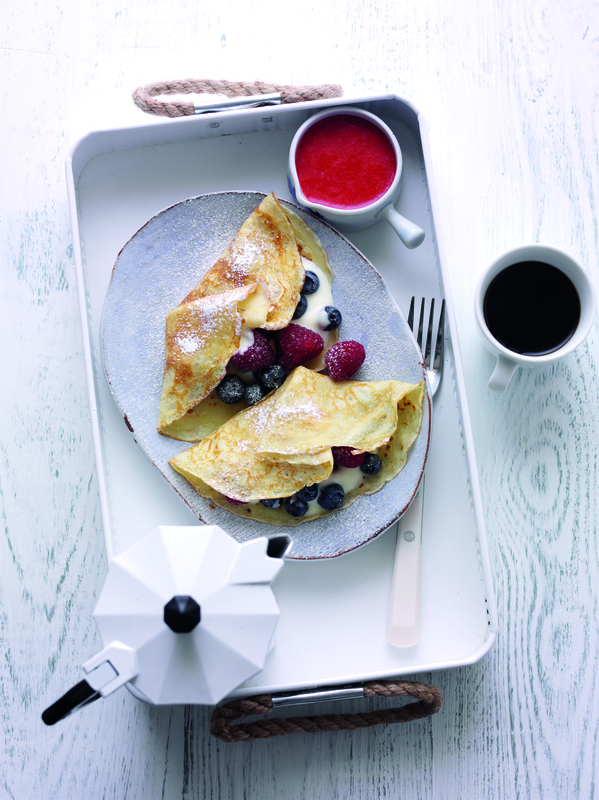 Sprinkle with any remaining berries, dust with a little sifted icing sugar and serve with a drizzle of strawberry sauce. To make chocolate pancakes, add 15g/1/2oz sifted cocoa to the bowl with the flour and up the milk to 225ml/8fl oz. Make and cook as above.